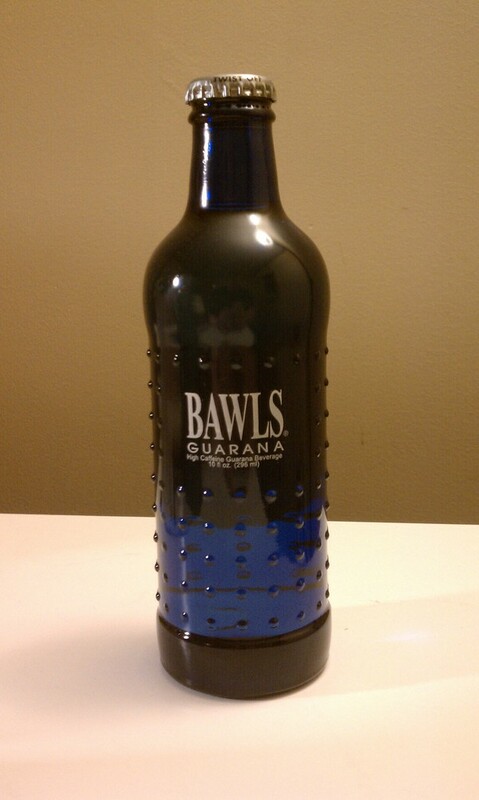 BAWLS guarana is a highly caffeinated soda, which has I have seen around for the last several years. Some people confuse this soda as an energy drink, because of the guarana and caffeine. The first time I ever had BAWLS was actually for free at a LAN center my old friend, Pat, had introduced me to in Weymouth, MA. The store has since closed but my original memories of this tasty beverage still linger. The unique blue BAWLS, yes joke all you want, bottle has bumps that give it a different handle. I have always been a fan of glass bottle beverages, its more interesting to look at and more collectible that way. BAWLS has always had a strong relationship with BMX, gaming, and paint ball companies and I think that was an extra allure I had to the brand. I recall overnight LAN parties and countless hours playing Battlefield 2, Call of Duty 2, World of Warcraft and other games chugging away at BAWLS guarana. Recently thought the company into tough times and after failing to find a buyer, restructured and are now being back by additional investments and have resumed operations. When you first open the bottle of a cold BAWLS the first thing you notice is a puff of mist. The smell has a light berry citrus smell with some vanilla overtones. The color is slightly off white toward a yellowish tinge from the guarana berry. The carbonation rushes out and lasts for a long amount of time. I have had regular guarana soda before that you would find in a Brazilian mart or maybe in the international section of your grocery store and I like this a whole lot more. The best way I can describe the taste is a blend between a citrus based lemon-lime soda and cream or vanilla cream soda. It is something unique and different indeed. The carbonation gives a nice tingle in the back of the throat as you swallow. I had several people try this soda and everyone seemed to like it. I also asked them to describe it and when they could gave my description and they also agreed. All in all a very drinkable beverage with some familiar flavors many people can enjoy. I hope this beverage will be around for a very long time and I hope to see it in my area again for sale real soon. I always see this stuff on ThinkGeek. Love the bottles, glad to hear it’s actually good. Excellent write up, I must try and track some of this down.